Though released theatrically by 20th Century-Fox, "The Cannonball Run" originally was found on video via Vestron Video rather than on Fox's video label. Among the initial Vestron Video disc releases on LaserVision, "The Cannonball Run" is a typical example of the bad things that happened in those days to movies on video. The print used for the transfer has numerous damaged and dirty sections throughout. The opening credits and the openiing section of side two are prime examples that this was far from a mint copy of this then-new movie. The transfer generally suffers from being very soft and has a faded color with a streaky image. In many ways, this presentation resembles a standard videotape image more that it looks like a higher quality disc. Also of note are what appears to be dubbed dialog sections. Language is some passages is replaced with what seems to be an edited for broadcast audio version of the movie. HBO Video has released both a DVD and blu-ray of "The Cannonball Run." These modern video releases are vast improvements in many ways over the original Vestron LV disc. The new versions still retain some of the same cleaned-up langauge, while other dialog is left original. I am not certain how this matches or doesn't match to the theatrical verison. The FLAT-1.85:1 film is presented full frame on this Vestron disc and has non-CX'd mono audio. Copies examined have all been Pioneer Japan pressings with some having one side of CLV-format and the other side is the then-new CAA-format of Extended Play. 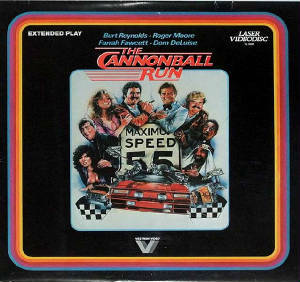 This LV release of "The Cannonball Run" is first seen in Pioneer's Winter 1983 software catalog. 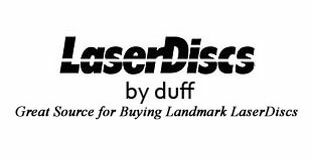 This title is among the eleven releases that made up the first Vestron Video offerings on the LV format found in that catalog.